The roadmap summarizes a group foresight process which includes both quantitative and qualitative input. Examples of quantitative input include statistical data, forecasts, and trends, including technical capacity growth trends enabling metaverse development. Historical growth in IT capacity and IT-related economics can help us understand when disruptive new emergences are likely to occur. Examples of qualitative input include subjective assessments, rankings, forecasts, and scenarios. Below is a qualitative forecast in one economic sector, telecom. Many such inputs are evaluated in the MVR. As broadband and VoIP gain market share, allowing next generation IP-enabled communications platforms (IM, chat, email, telephony, conferencing, television) to begin to arrive, we forecast users will increasingly associate personal avatars with their public personas, and use them to mediate contact with the world. 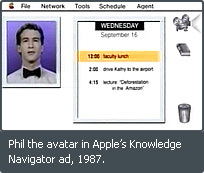 Avatars are more friendly, personalized, and interactive relative to static images or linear narratives (slides, movies), and will become increasingly useful as they are able to encode personal interests of the user, and direct inquiries to the user's data (avatar-as-search-interface). Automation will accelerate this transition via personal database and email mining advances. Tomorrow's keyword and interest mining will improve context-specific search, social networking, education and training, personality modeling, and other online activities. Given trends in automated knowledge discovery, knowledge management, and natural language processing, within ten years a caller should be able to have a primitive yet useful natural conversation with an avatar and gain significant personal information about the represented individual. This will include simple information about the user's background, interests, present location, availability status, and future plans, as well as the ability to schedule meetings with trusted parties, answer FAQs, manage e-commerce, and perform other simple transactions. 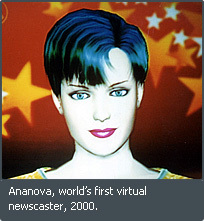 Consistent with trends toward an increasingly visually and verbally automated, user-centric, and accelerated Metaverse/Attention Economy, we can expect avatars to become first-pass communication screeners, with social network access, product, and service delivery increasingly qualified by simple human-to-avatar and trusted avatar-to-avatar conversations. Semi-asynchronous avatar-mediated chat may even become the preferred first communication layer for those seeking greater creativity, novelty, productivity, privacy, or security. Would you like to help develop the inaugural 2006-2016 roadmap? Public participation is encouraged. For more, browse our Metaverse Roadmap Overview and the MVR Inputs, our 2007 summaries of expert foresight perspectives from the 2006 Metaverse Roadmap Summit.